GM has announced it will invest $370 million in a new 552,000 square-foot plant in Flint, Michigan to produce the 1.4-liter four-cylinder engines intended for duty in the Chevy Cruze and Chevy Volt. The engines will be rolling off those new lines in two flavors — turbocharged with 140 HP and 148 lb-ft of torque for the Cruze, and a non-turbocharged 100 HP version for the Volt. The plans also indicate the 1.4-liter is destined for service in two additional U.S.-bound models expected to debut in the 2011 time frame — helping GM to their planned goal of "one-third of...North American engine volume will be four-cylinders by 2011." Complete details on this huge win for the city of Flint (Won't Michael Moore be proud!) and details on the tech in the engines below the jump. GM's 'Boost' In Efficient Four-Cylinders Includes More Turbos Strategy Highlighted by the 2011 Chevy Cruze's new 1.4L Turbo that is Expected to Be a Fuel Economy Leader FLINT, Mich. – GM will double its global production of small four-cylinder engines (1.0L to 1.4L) by 2011, with more than half of the increase coming in North America. 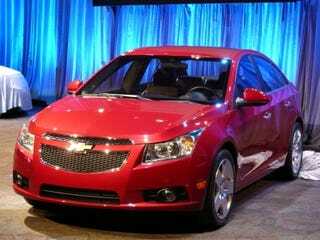 The strategy is highlighted by an all-new, 1.4L Turbo engine that will power the 2011 Chevrolet Cruze. The 1.4L Turbo enables great vehicle performance and fuel economy. In fact, the Cruze is expected to be a fuel economy leader in its segment when it launches in mid-2010, and its new engine reinforces GM’s commitment to replacing larger-displacement engines with more compact, advanced four-cylinder engines that optimize performance and fuel savings. One-third of GM’s North American engine volume will be four-cylinders by 2011, and 21 percent of the four-cylinder volume will be turbocharged – a seven-fold increase over today’s volume of turbo engines. “Power-dense four-cylinders such as the 1.4L Turbo are an integral part of GM’s portfolio of advanced propulsion technologies, including cam phasing, direct injection, Active Fuel Management, clean diesels, hybrids, flex-fuel vehicles, six-speed transmissions and electric propulsion,” said Tom Stephens, executive vice president, GM Global Powertrain and Global Quality. “GM is focused on delivering vehicles that look great, are fuel efficient and fun to drive.” The Chevy Cruze is such a vehicle. It is an all-new, global compact car that will be built for worldwide distribution at GM’s Lordstown, Ohio facility. It will be offered with the 1.4L Turbo in North America, along with additional small-displacement engines for models sold outside of North America. A non-turbocharged 1.4L variant will serve as a secondary energy source for the 2011 Chevrolet Volt extended-range electric vehicle. For trips up to 40 miles, the Volt’s primary source of power comes from its lithium-ion battery. When the battery’s energy is depleted, the 1.4L engine activates, generating electricity to power the Volt for several hundred additional miles until its battery is recharged. 1.4L Turbo details At 100 horsepower per liter, the new turbocharged 1.4L has the power of a larger engine but retains the efficiency of a small-displacement four-cylinder in most driving conditions. “Because of the turbocharger’s on-demand power and responsiveness, it’s like having two engines in the same vehicle – one for power and one for fuel economy,” said Stephens. “It’s truly the best of both worlds.” The 1.4L’s turbocharger is integrated within the exhaust manifold, for reduced weight and greater packaging flexibility in smaller vehicles. A reinforced crankshaft and stronger connecting rods are unique, delivering additional strength to support the engine’s pressurized, high-rpm performance. Estimated power ratings for the 1.4L Turbo will be 140 horsepower (104 kW) with a torque rating of 148 lb.-ft. (200 Nm). In addition to the Chevrolet Cruze, GM will introduce the 1.4L turbo in the U.S. in two additional GM models in 2011. Global engine family GM’s small four-cylinder gasoline engines include displacements of 1.0L, 1.2L and 1.4L. The engines were designed with fuel efficiency in mind, including technology such as full variable valve timing that optimizes power and fuel efficiency across the rpm band. More importantly, torque for these engines – the pulling power that is felt when accelerating from a stop – is generated at lower rpm, for strong, off-the-line launches and confident acceleration at all speeds. Supporting powertrain features, such as torque converter design and transmission gearing, accentuate engine power and contribute further to the feeling of performance. All engines in the family have premium design elements that contribute to world-class smoothness and durability, including: * Dual overhead camshafts * Roller-finger follower valvetrain * Chain-driven camshafts * Flow-controlled oil pump * Piston-cooling oil jets * Thermal management The engines also incorporate numerous mass-reducing features, including a cast iron block with a hollow frame structure, hollow-cast camshafts, and on non-turbo engines, crankshafts with hollow-core main bearing journals and connecting rod journals.